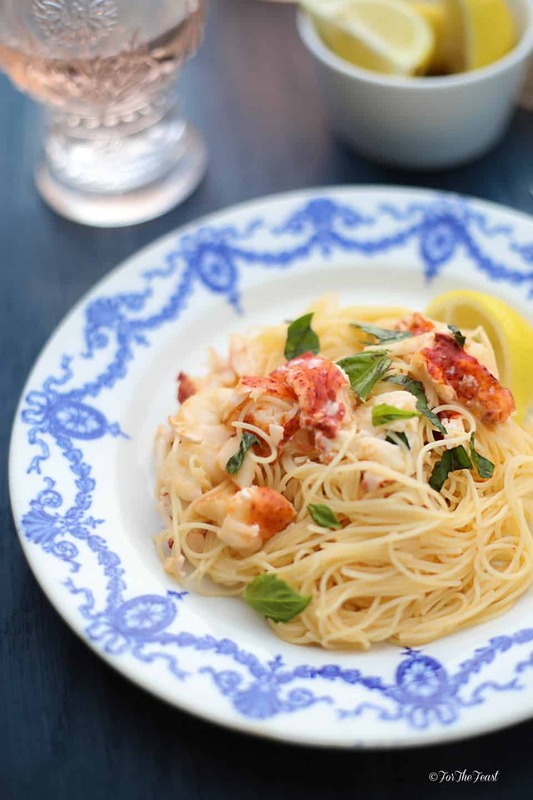 Lobster and Mascarpone Lemon Sauce served over Angel Hair Pasta is a quick and easy dish for the week or as a weekend treat. There’s so much you can do with lobster meat. You can mix it with lemon and mayo on a toasted bun, toss it with a salad, or add it to a creamy risotto or soup. Lobster and Mascarpone Lemon Sauce is a simple recipe for summer that’s delectable. Note: You can make this Lobster and Mascarpone Lemon Sauce with just the lobster tails or a whole lobster (tail + claw meat). 1. Call a few stores to see who has live lobsters or at least lobster tails. 2. Ask if they can steam them for you. This is a free service. 3. When you first arrive at the store head straight to the seafood counter and pick out your lobsters or lobster tails. 4. When picking out lobsters choose an active female lobster. The more active the lobster, the more tender the meat. Also look for long antennae, this is also another indicator for tender meat. 5. Once you have the lobster picked out have them steam the lobsters for you. 6. While they are steaming the lobsters do the rest of your shopping. Depending on how busy they are this usually takes about 15 to 20 minutes. Easy. Right! Here’s an easy and quick video on how to clean your lobster once you get home (video is 1 minute and 18 seconds). Don’t forget the wine: There are 2 types of wine I enjoy with this dish. I like a Dry Rose from Provence or a Chablis from France. Also a good Chardonnay will be perfect with this dish too. Lemon butter (2 lemons juiced with 1 tbsp of butter) warm this up in the microwave for about 15 to 25 seconds or until the butter is melted. 5 to 7 tbsp of pasta water (when you are boiling the pasta you will need to use some of this water for the mascarpone sauce). Start out with 5 tbsp of pasta water and add more if you need to. Remove the lobster meat from the tails (and claws if you purchased a whole lobster). Slice the lobster meat into bite size pieces and mix with 1 tbsp of the warmed lemon juice butter mixture. Cook pasta, bring water to a boil (add the salt once the water is boiling) then add pasta. Note: this pasta cooks quick (5 to 6 minutes) so pay attention! Next, in a bowl mix the mascarpone with half of the lemon butter sauce, parmesan cheese, 5 tbsp of pasta water + salt to taste. Take your pasta while it is hot and add it to the mascarpone mixture. Mix so that all of the pasta is covered with the sauce. If you have claw meat add it to the pasta mixture. Continue to season with salt and cheese to your taste. Divide the pasta between 4 bowls and place the lobster meat on top of the pasta and sprinkle with basil. Evenly pour the rest of the lemon butter sauce on top of the 4 portions of lobster. Garnish with fresh lemon wedge on the side. Yummy. Im going to try this. Especially with the free steaming service. Who knew? Great tip!